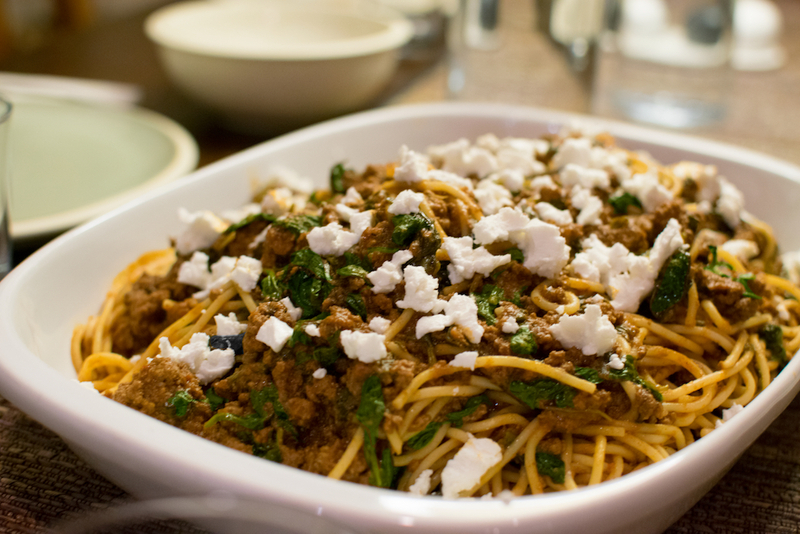 I’m excited to share one of our family favorites, Moroccan-Spiced Meat Sauce with Goat Cheese! This is one of my family’s go-to dishes since I was a little kid and we make it all the time! It’s hearty, spicy, meaty, with a little kick. The thing that makes this dish special is the combination of unique spices such as cumin, cinnamon, ginger and more! They all work together to create this amazing flavor that I can’t even explain with words… you will just have to try it! Then we top it with goat cheese that adds a creamy, tangy element and cools down the spice. It’s a truly amazing dish and I really hope you guys give it a try because I think you’ll love it! Moroccan pasta is one of my favorite meals ever! Whenever my mom asks Lexi or me what we want for dinner, this is usually what we ask for first. 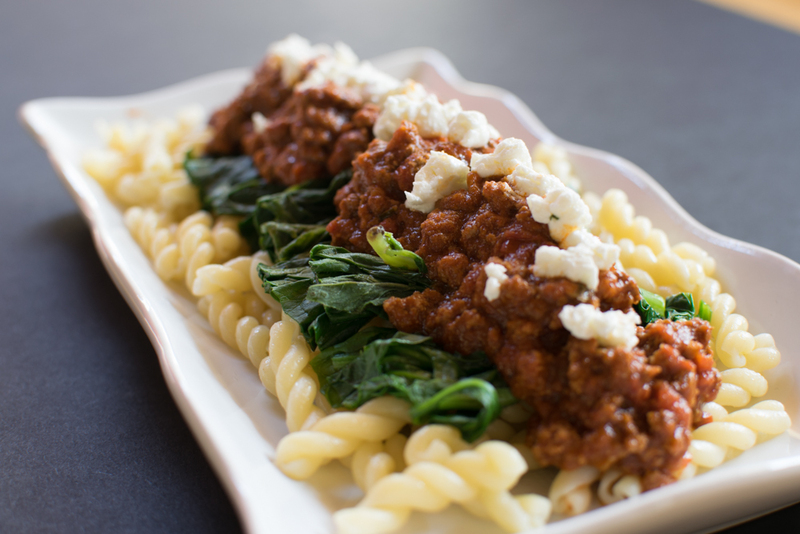 The spicy meat sauce with a hint of cinnamon and creamy goat cheese is just so delicious. The spinach adds heartiness and soaks up all the amazing flavor from the sauce. I have made this for many of my friends and they always rave about it! Place the oil in a large saucepan and heat over medium heat. Sauté the onion and garlic until the onion is translucent, about 5 minutes. Add the beef and cook until browned and crumbly. Add the cumin, paprika, ginger, cinnamon, and cayenne. Stir until evenly mixed. Pour in the pasta sauce and simmer over medium-low heat for about 15 minutes. While the pasta sauce is simmering, cook the pasta according to the instructions on the package. Drain the pasta. Put all the spinach into the pasta sauce and keep stirring until the leaves are wilted. Season with salt and black pepper to taste. 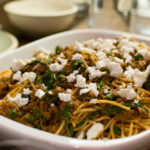 Top the pasta with the meat sauce and sprinkle with small chunks of goat cheese. To take to lunch, pack your leftover pasta and sauce in a container and store in the fridge. store the goat cheese topping in a separate small container. The next morning, pack the containers in your lunch box with an ice pack and bring a fork. You can warm it up in the morning and pack it in a lunch thermos or if you have the option, you can warm it up in a microwave once you get to school. Sprinkle on the goat cheese, and enjoy. You look sooo much like your Grandma Peggy did at your age! Good luck. You are amazing!